When J.A. 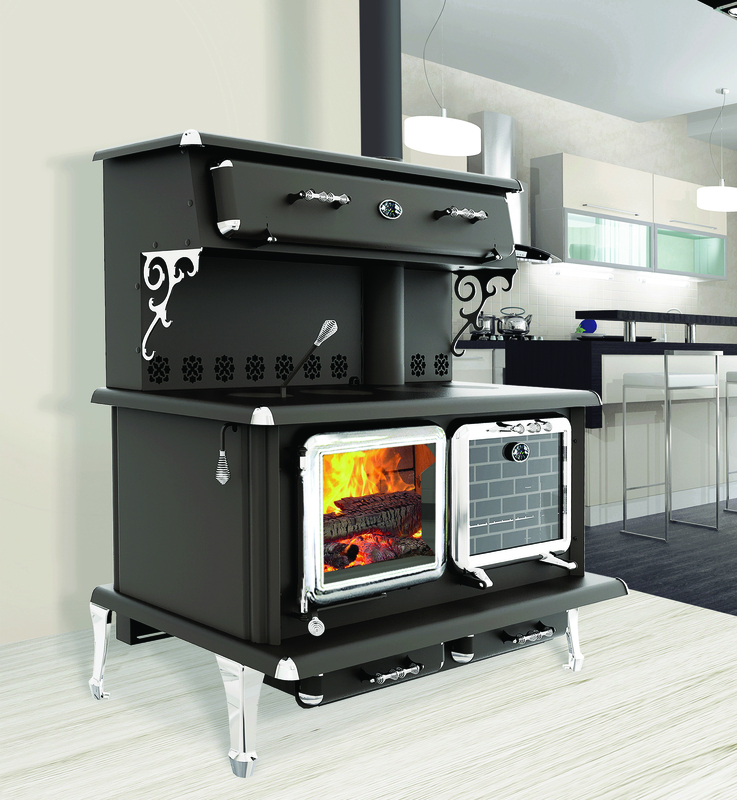 Roby began life in 1975, the only connection they had to stoves were the fireplace doors they manufactured alongside many other parts and accessories for home decor. However, that all changed when Alain Robitaille became co-owner of the company and by the early 1980s, J.A. Roby was in the business of making woodstoves. With over thirty years now behind them, J.A. 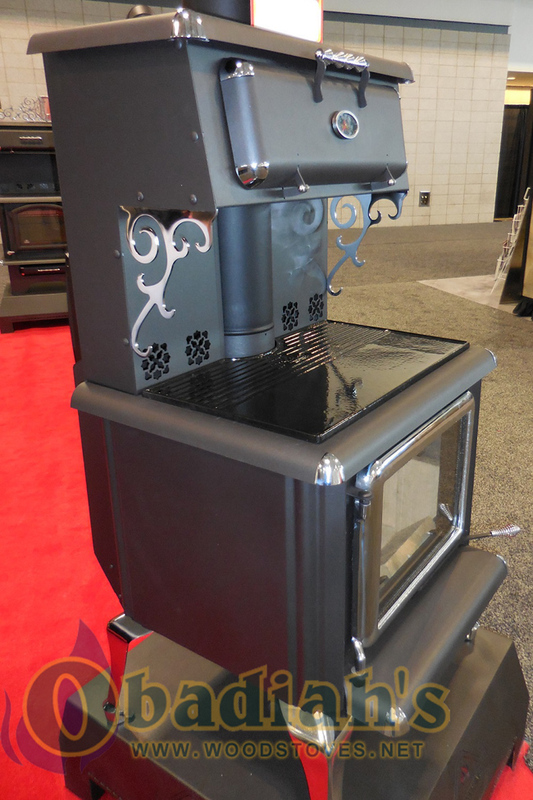 Roby knows a thing or two about making quality stoves, and their wood burning cookstoves are no exception. 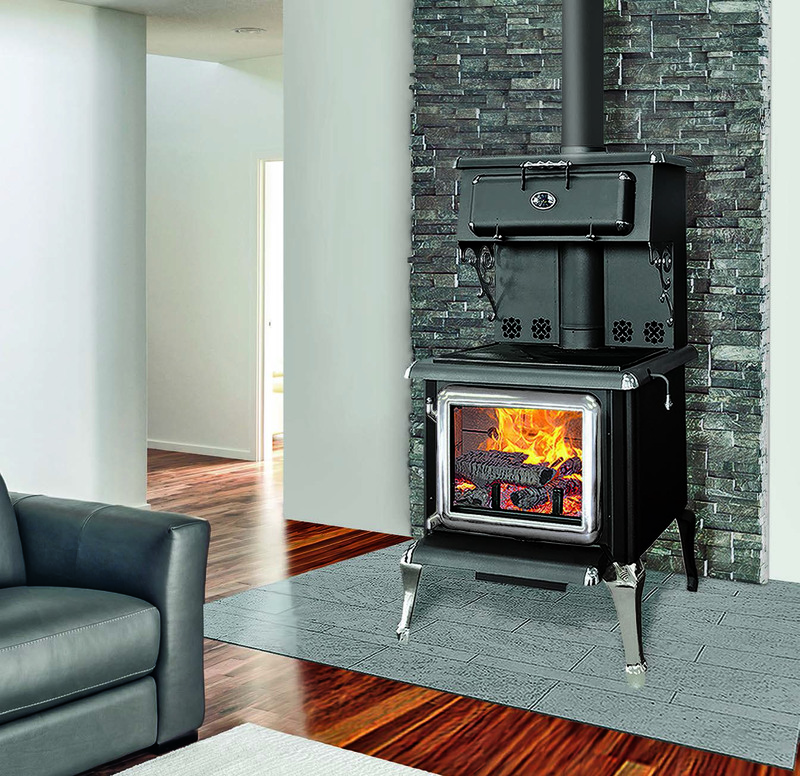 Smaller than the Forgeron, yet with a slightly larger firebox, the 2500 Cuisiniere cookstove is another great option for anyone with small space demands or tight quarters. 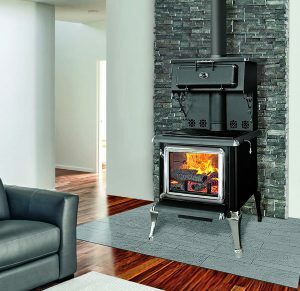 At 26″ wide, it can easily heat up to 2,500 feet with a burn time of an astounding 22 hours, meaning you rarely have to worry about reloading and can simply bask in the warmth of this stove all day. 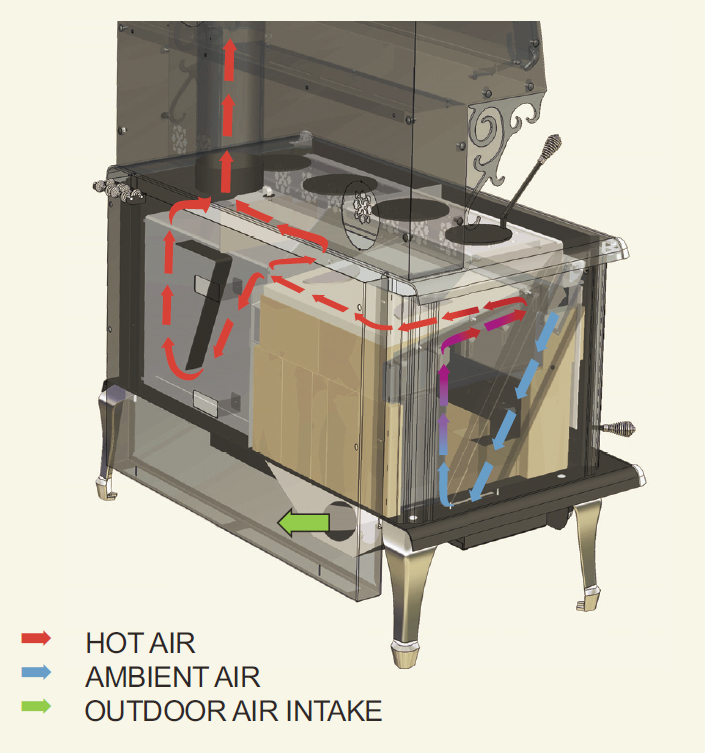 Plus, with the secondary air system, you can rest assured that those long burns will be extremely efficient (88%!). 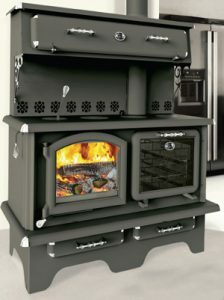 The 2500 Cuisiniere is similar in style to the Forgeron and offers an optional chromed cast-iron door, which adds a unique flare to the front of the firebox. You’ll also find all of the features you could want in a smaller cookstove: An easily accessible warming closet, ash drawer, glass air-wash system, and a firebox lined with refractory brick. 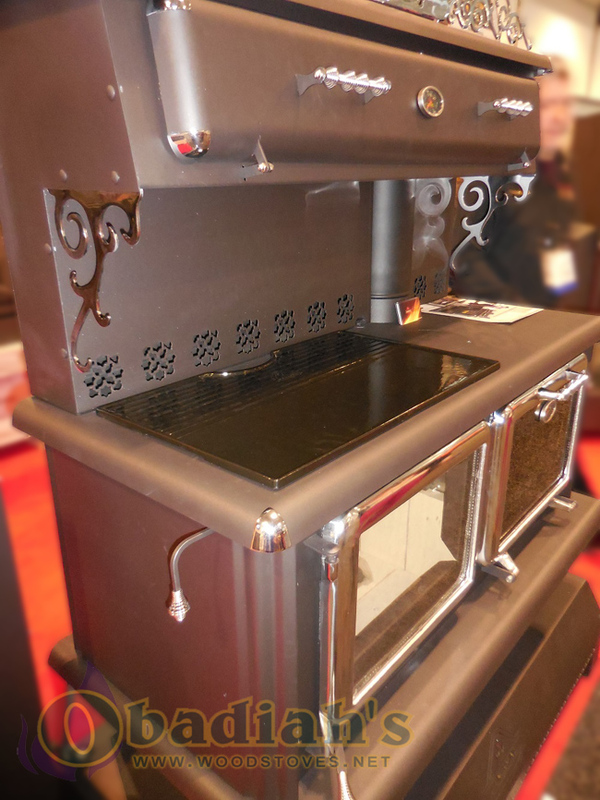 Combine that with the EPA and Washington State approval, and you’ve got yourself one outstanding little cookstove. Heat Capacity Up to 2,500 sq.ft. Recommended Chimney Height 12 ft. 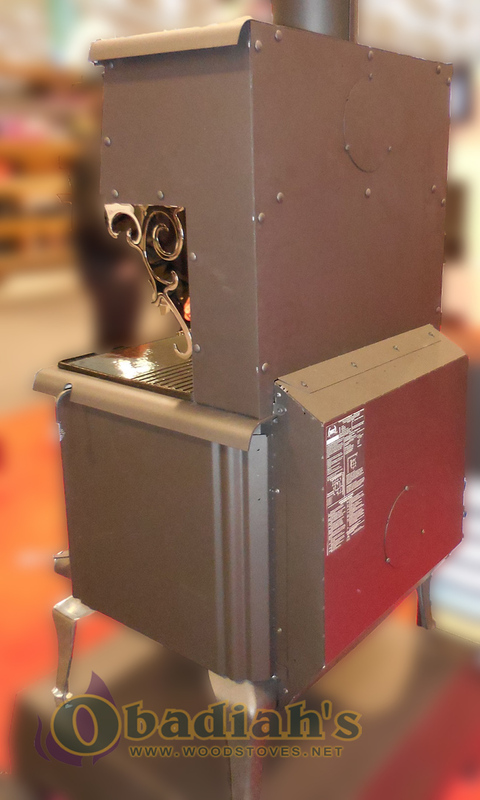 The original Cuisiniere cookstove was initially a very exciting stove, with a unique clean-burning EPA firebox that had a lot of potential. As time went on though, many noticed the oven was extremely difficult to heat- a serious problem with a stove meant for cooking. Obadiah’s could not, in good conscious, recommend it to customers. That’s all changed today though, with J.A. Roby listening to the issues and not only resolving them, but vastly improving the original while also introducing this model: The Cuisiniere SE. 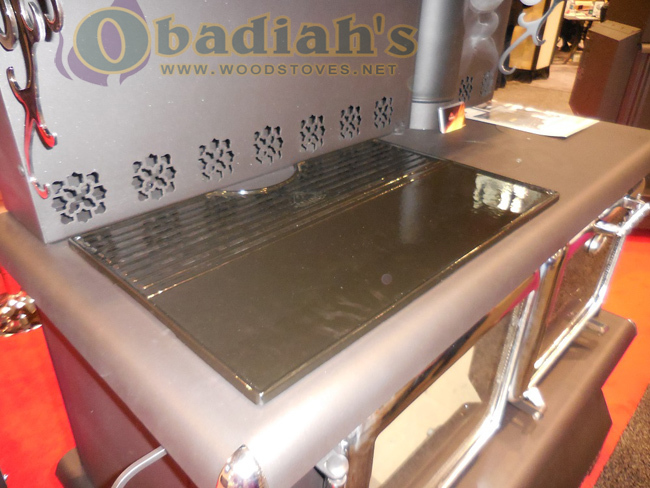 This special edition of the Cuisiniere does not sit on a pedestal like the original model, offering chrome (or black) legs and doors, along with a multitude of other features including a food warmer, a glass air wash system, glazec oven, a fiber ceramic baffle, and much more. 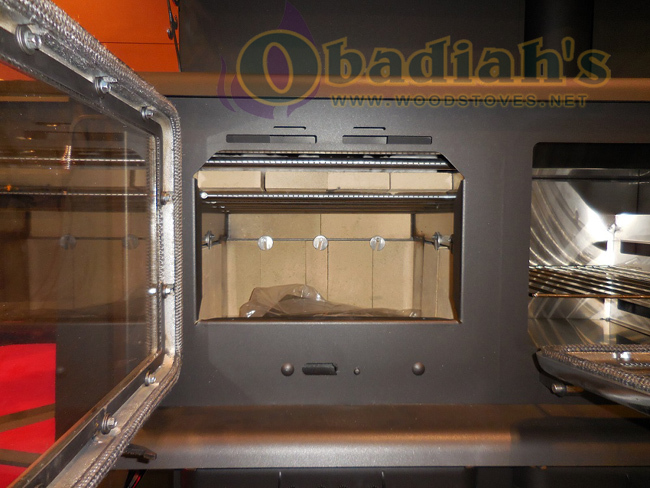 Most importanly, however, is the way the smoke is distributed within the stove now: Like the updated regular model, the firebox in the Cuisiniere SE sits on the left with the oven on the right. With this arrangement, the smoke travels across the underside of the cook-top, around the rear of the oven, and exits out the chimney, which is above the oven. With the smoke filtering around the oven like this, heat is distributed more evenly and cook times are greatly improved. 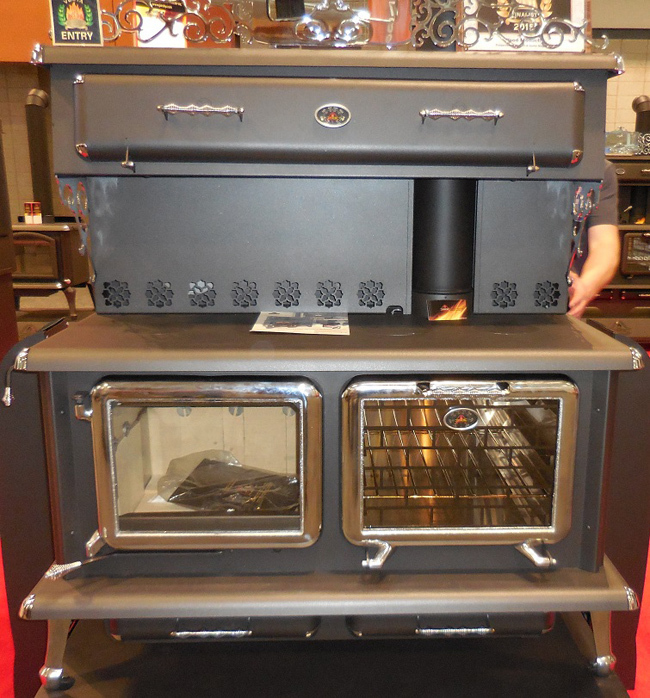 The Cuisiniere SE can heat up to 2,300 sq ft with its immense 95,000 BTU/hr heat output, and with 88% efficiency it is also EPA-exempt and Washington State approved. It might be a hefty stove with a larger profile, but the Cuisiniere SE is a quality cookstove in all of the right ways. 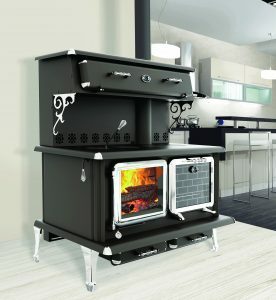 The original Cuisiniere cookstove has been updated with features that greatly improve the quality of its cooking abilities, while retaining its classic style. With a pedestal bottom, side-by-side oven and firebox, and a food warmer on top, the Cuisiniere has an unmistakably traditional look and layout that will be the centerpiece of any rustic home. In the original design of the Cuisiniere, the oven was on the left while the firebox was on the right, with the chimney above it. This led to a serious heating deficiency for the oven: Because all of the smoke from the firebox went straight up the chimney, the oven would only receive heat from one side, resulting in slow, uneven cooking. Thankfully, the folks at J.A. Roby resolved this. 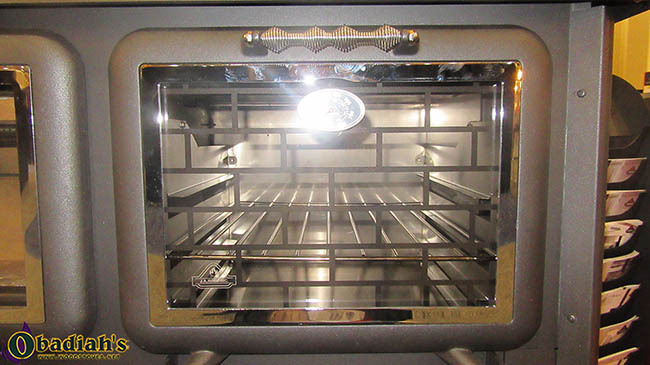 In the updated model of the Cuisiniere, the firebox is on the left while the oven is on the right, allowing smoke from the firebox to filter around the oven before exiting up the chimney. Now you get wonderfully even cooks in a reasonable amount of time! It’s important to note this change, as there are many original models still floating around out there. So if you stumble across a Cuisiniere cookstove with the oven on the left/opposite the chimney, be warned! It is not going to cook efficiently. The stove comes in quite wide at 50 inches, but if space is no issue and you find the look preferable to the Cuisiniere SE. We are happy to recommend the Cuisiniere once again, and J.A. Roby’s commitment to improving their products based on customer feedback clearly demonstrates the kind of values we love to see from manufacturers. Flow of smoke in the updated Cuisiniere. Type of chimney 2100º F. – 650º C.
J.A. 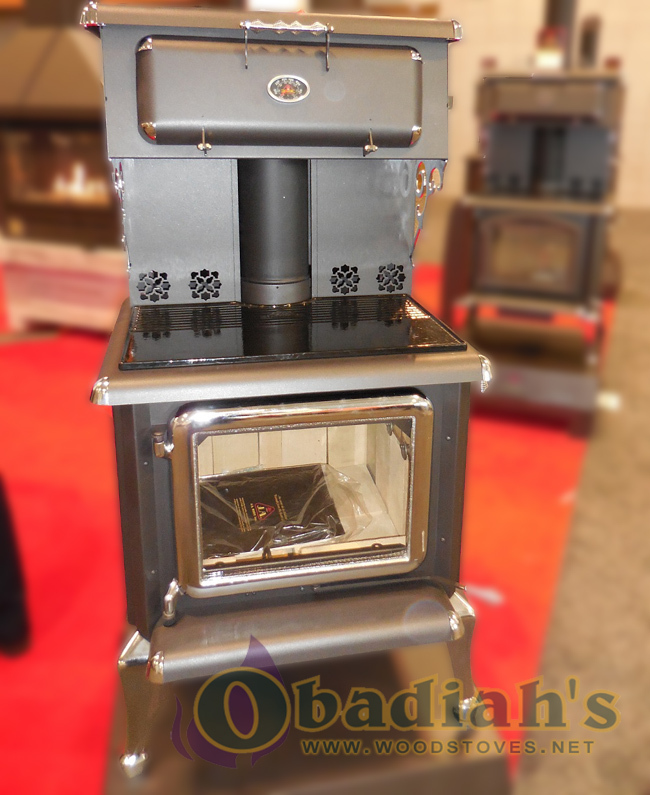 Roby cookstoves and more can be found at Obadiah’s Woodstoves and Alternative Energy!